magnets from Eriez, Erie, PA, safely lift and move steel sheets without direct attachment by slings, hooks or cables. The permanent magnets require no manual operator intervention, enabling quick, efficient handling. 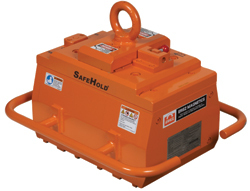 SafeHold APL magnets are designed so that an operator is not required to manually release the magnet. They require no electricity, with no costly DC power supply nor a recharge. The magnets can be used singly or in multiples on a spreader beam. They come in three models to handle loads to 5800 lb.